When we decided to just get married in London, we planned the ceremony on year in advance. But as I’m French and my husband English, we still had to go through a specific process with the consulate, which was a bit complicated, not to mention that we now live in France. 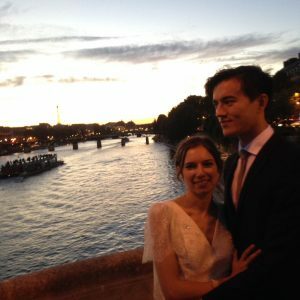 One month before the wedding, we realised we wouldn’t have the papers on time, so we decided to organise another ceremony in Paris, before the planned day in London. Just so that we would actually be officially married before the celebrations. 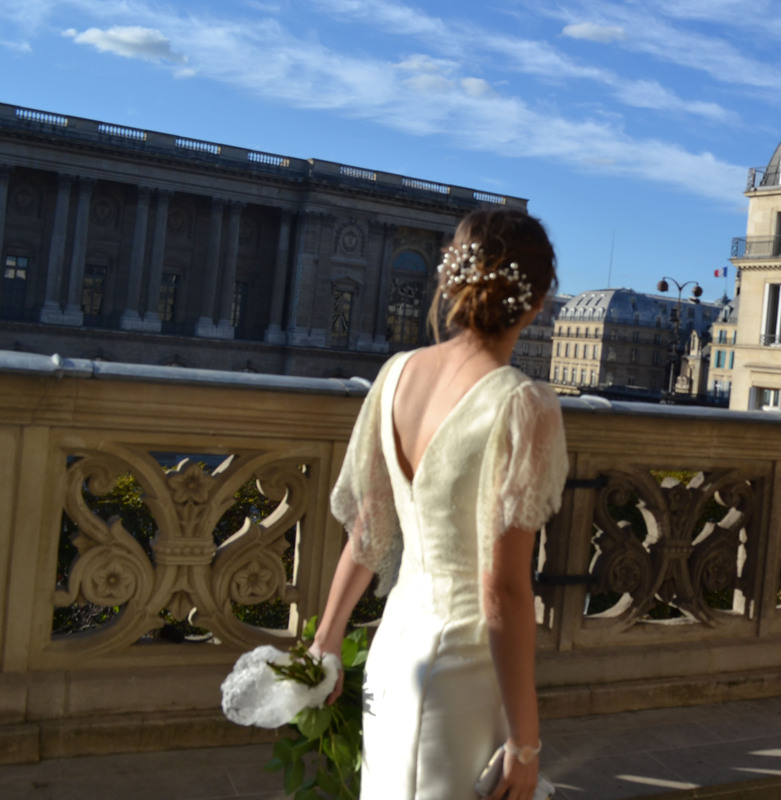 We are very lucky to live in the 1st arrondissement of Paris, where the city hall (you have to get married at the local city hall in France, and it’s free) is actually facing the Louvre. 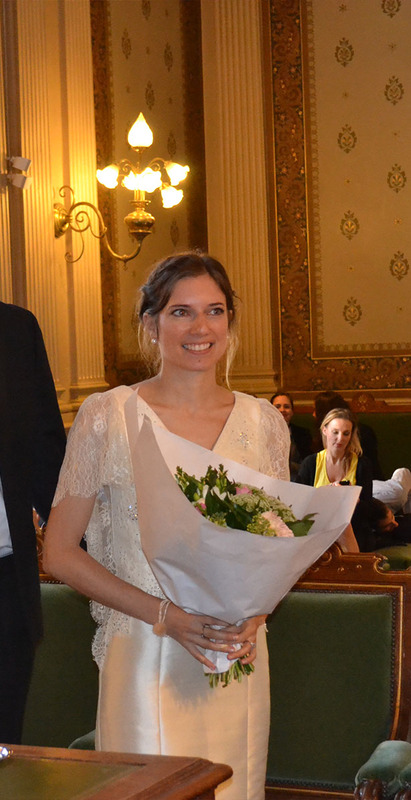 So we decided to organise a real wedding in 3 weeks, which meant another reception and… another dress (too bad !!). It may sound great, but it was actually incredibly stressful as we only had 3 weeks to do it !! We decided to have some drinks at the city hall, then a stroll along the river on the way back home, and a buffet reception at home. I looked everywhere to find a dress that wouldn’t be too expensive. I found a great dress in the north of Paris for €169. I still wanted it to look a bit different from the dress I was going to wear in London, even if neither of them would be too wedding-y (as in, no big dress). What I liked was that it had a little bit of lace, and short sleeves which gave it a retro style. I ordered a few things on Amazon: little barrettes with pearls, which made a very simple bun look nicer, and some balloons and flowers to decorate our flat, where we would host the reception. I did my hair and make-up on my own, following some youtube tutorials, and it took me a while as it always looks easier than it actually is ! I wore the same earrings (pearls) that I had planned on wearing in London, and a bracelet I’ve had for years. 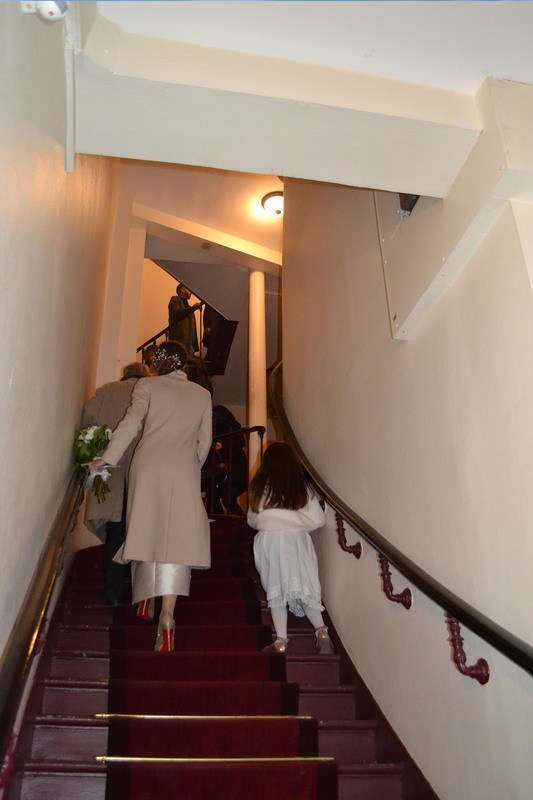 We were very lucky with the weather which was very sunny and fairly warm, but the ceremony being at 6, as we planned to have some champagne of the city hall terrace, I asked my dad yo bring me a beige coat I bought when I was 16, to wear on the walk back home. I had bought sparkling gold Louboutins for the London wedding, but they were too small, so I couldn’t see myself wearing them all day on the Saturday, however it was bearable for that evening. And I just chose a bouquet of white flowers. In perspective, it was great to get both ceremonies, in Paris and London, even if we felt really upset when we realised we couldn’t get officially married where we had planned to.